Description: The Basic Belt is an easy Macrame pattern, since it requires you to know only one knot, the Bush Bar. Normally this decorative knot is tied so that each one is close together. 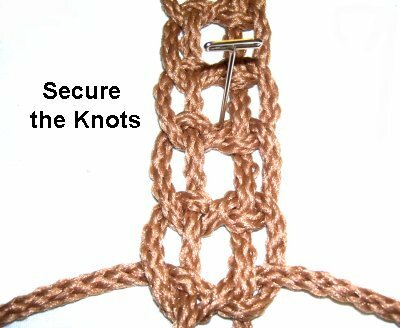 However, I recommend you add some space between the knots to give it a more woven appearance. 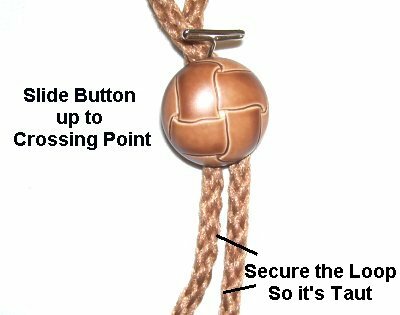 The clasp is a simple loop with a button or bead on the other end. 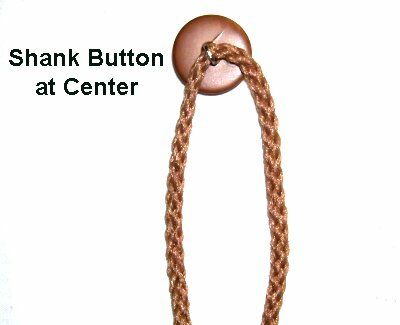 Listed in the Micro-Macrame section is a Bush Bar Bracelet, which looks great with this Macrame belt. You can also use this basic belt design to make a guitar strap. Just leave a small loop at each end to attach to the screws in your guitar. Step 1: Cut one cord, 8 times the length you need for the belt. For example: If you are planning to make a 36-inch belt, cut the cord to a length of 8 yards. Prepare the ends with tape, glue or wax to prevent unraveling. 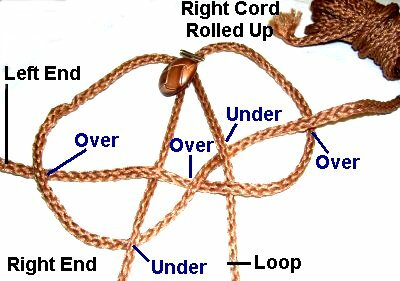 Match up the ends and locate the center of the cord. Slide the cord through the button shank and let it rest at the center for now. Turn the cord around so the ends are near the top of your board, and the button is at the bottom. The button needs to be face up before you get started. Step 2: The size of the large loop you will now make determines the overall size of the Basic Belt. So for a 36-inch size, move up 36 inches, measuring from the center. Cross the ends right over left. Secure the crossing point to your board. Step 3: Slide the button up to the crossed area, so it rests against the pin. 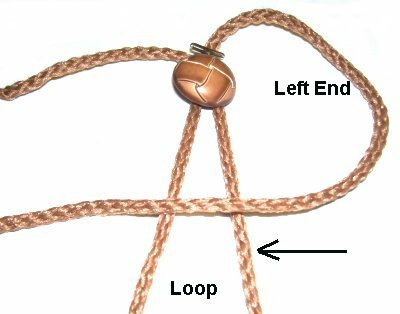 Secure the loop, making sure the cord has tension and both halves are straight. 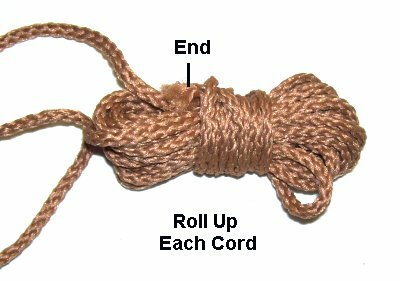 Wrap one end of the the cord around your hand several times. Start about 12 inches from the button. Step 3, continued: Stop wrapping when you have about an arm length left. Remove it from your hand, and wrap the end around the middle of the bundle. Tuck the end under the last wrap. As you progress, pull to get more material. Step 4: Use the left end first, which is now on the right, since you crossed them. Bring it towards the left horizontally, passing over both parts of the loop. Step 5: Bring the right end (now on the left) over the left end, and under the left part of the loop. Move it over the portion of the left end that rests inside the loop. Step 5, continued: Pass it under the right part of the loop. Finally, go over the left end where it curves on the right. Important Tip: Another way to view this step is that the right end will pass over three parts of the left end, and under both parts of the large loop. 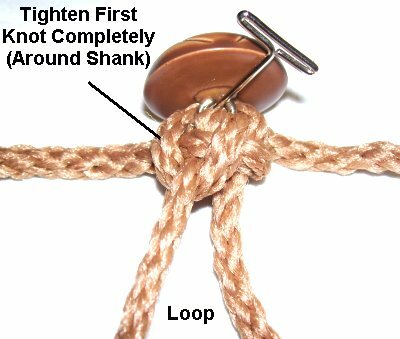 Tighten the first knot completely, so it wraps around the shank of the button. If it bunches up, pull on the loop to make it as flat as possible. Step 6: Repeat steps 4 and 5 to make the next knot. 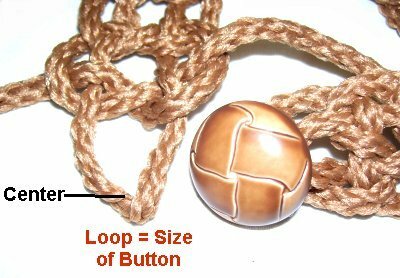 Make sure you always use the cord on the right first, followed by the left one, which does the weaving. 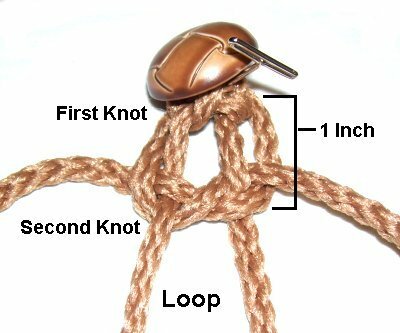 Step 7: As you tighten the knot, leave 1 inch of space between it and the first knot. 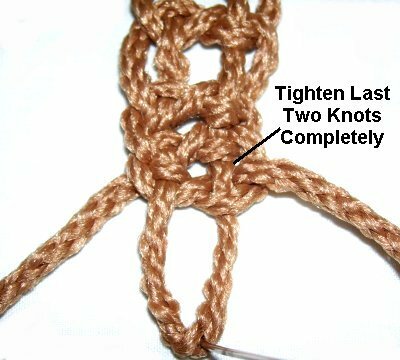 Pull on the loop to keep the knot flat and to avoid twisting. Design Tip: The Bush Bar can be made with less space if you prefer a more closely woven design. 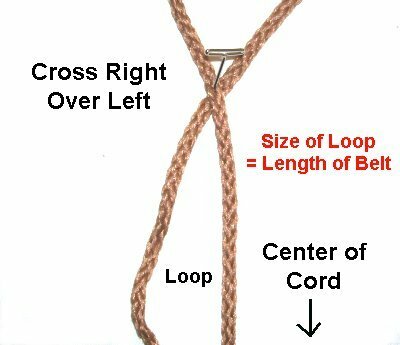 You will need to tug on the loop more as you tighten the knots, to keep the belt as flat as possible. Repeat steps 6 and 7 to make the rest of the Basic Belt. 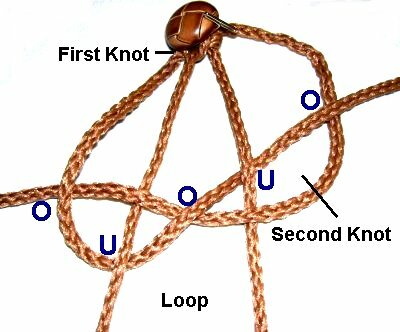 Secure the knots as you progress, and move the design as needed, so the newest knots are always on your board. Step 8: When you reach the end make sure that the loop is the size of the button. Step 9: Tighten the last knot completely. Tie one final knot, also tightening it as much as possible. Be sure the loop can still go around the button easily. Make adjustments to the size if needed. Step 10: Turn the Basic Belt upside down. Cut off the extra material, but leave 2 inches for the final step. 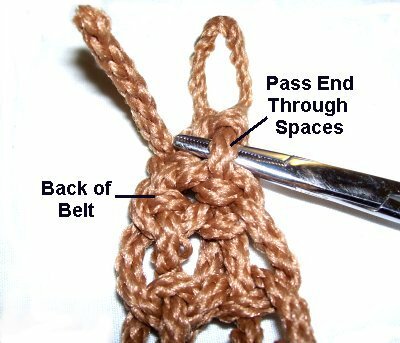 Use pliers to pull the ends through spaces in the back of the belt, where the last two knots are tightened completely. Apply glue to the ends to hold them in place. Have any comments about the Basic Belt? Contact Me.